If you think these Chippewa Men's 55026 Brown Steel Toe EH Logger Boots are tough and rough on the outside, you’re absolutely right. The rugged uppers lace up and are made from heavy-duty tough bark brown leather. This makes them resistant to scrapes, scratches, ... (see full details) (see specifications) #CHP55026. If you think these Chippewa Men's 55026 Brown Steel Toe EH Logger Boots are tough and rough on the outside, you’re absolutely right. The rugged uppers lace up and are made from heavy-duty tough bark brown leather. This makes them resistant to scrapes, scratches, and scuffing. They have ASTM-approved steel toe protection to guard you against injuries from compression, impact, and stubbing. And that's just the beginning of what they have to offer to you. The Goodyear Welt construction makes these shoes durable and long-wearing. In this construction method, the leather uppers are sewn to the durable soles with multiple strands of heavy-duty thread. As long as the uppers remain sound, you can replace the soles to give these men's boots a longer lifespan. These steel toe boots are also electrical hazard rated to protect you from shock in case of accidental contact with live circuits or electrically charged tools. Yes, this premium footwear is built to protect you, but they’re also designed for comfort. The insides are lined with high abrasion nylon to keep your feet comfortable and protect against blisters. The removable FLEXWELT cushion orthotic footbeds provide padding for all-day comfort, and the steel shanks give you arch support for stability. The outsoles are made from Industrial Quality rubber for endurance, and they’re slip- and oil-resistant to keep you steady on wet or uneven terrain. Even the hardware is non-tarnishable, including the hooks and the eyelets. With these Chippewa Men's 55026 Steel Toe Logger EH Boots, you get tough protection and lots of comfort. Order your pair online from the Working Person's Store today. I read a lot of reviews on multiple sites before making this purchase. The biggest complaint seemed to be that were made in China and not AMERICA. To be honest, they are so comfortable, I don't care if they were made in China, or even at the Chinese restaurant down the block from me. I love these things. Comfortable right out of the box, and within a few days of working, they feel amazing. Very happy with my purchase. Plus with the coupons this store offered, you won't find a better price. I bought these 4 years ago as a "weekend / general purpose" type boot. I have worn these infrequently for this time, only occasionally as a daily wear. Mostly for nights / weekends for light / medium duty purposes. I can't attest to their durability as daily wear, but for my purposes they have held up extremely well. Tread has held up well, and the stitching has not frayed. Probably my only gripe are the laces, they still work fine and have not broken, but have frayed a bit and some of the outer sheathing has torn off. I'd recommend better quality laces, however they do work well enough. Overall they have held up well, I wouldn't worry much about durability as daily wear given my experience with them. Comfort wise I was very impressed. I have always like the way Chips fit my feet, I expected comprises to be made with this considering the price, however I was pleasantly surprised. To this day I think this is one of the more comfortable boots I own, Arch support is reasonably good, but with a good pair of inserts you're in good shape wearing these all day. A couple years ago I even ended up walking across Boston, MA for a whole day wearing them, I have worn some sneakers less comfortable. Brand new they didn't need too much breaking in and even 4 years later still have good support to them. The steel toe is comfortable and I can easily forget they are even a safety toe at all minus the extra weight, no cutting into my foot or uncomfortable creasing / bending in my experience with these. They are as heavy as you would expect an 8in steel toe boot to be, I'm used to wearing heavy boots and these are reasonable in my opinion. These aren't advertised as waterproof or resistant, however do a good job at keeping my feet dry in wet and rainy conditions so long as I'm not slogging into calf deep puddles and walking for two hours through a torrential downpour. They aren't insulated, however my feet keep plenty warm with a good pair of socks during New England winters. Not surprisingly they are hot the summer. 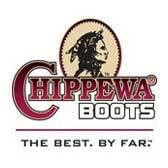 I was curious how these boots would fair for the price considering they're an "affordable" Chippewa. I don't think they would hold up as long as a higher tier Chip in severe daily conditions, but for most other cases I think they will do great. I have been very happy with mine and do recommend them for some one looking for a less expensive but still reasonably good quality logger boot. As an extra or backup boot they would do exceedingly well. Chippewa Boots: Men's Steel Toe 55026 EH 8 Inch Logger Work Boots is being added to your cart.